Anybody who has watched NDTV down the years knows that Prannoy Roy (who appears to have instructed correspondents to highlight his educational achievements: Yesterday one of them said, "Prannoy... I'm sorry, Dr.Roy") loves liberalisation and the stock market. Every February 28, he suggests the best way of judging the budget is tracking the market's intra-day movement. But there's one business Prannoy Roy seems to abhor: ports. NDTV has been conducting a drive to Save India's Beaches. Perhaps because of worries this would be regarded as elitist, this has now morphed into a campaign to Save India's Coast. Roy emphasises it's not about people tanning themselves on golden sands but about the livelihoods of poor communities. The programme is sponsored by Toyota Etios. It stands to reason that the manufacturer of machines that cause massive amounts of pollution is chosen to fund an environmental crusade. Perhaps the problem is with the medium itself. Is television well equipped to handle complex issues while maintaining ratings? TV programmes depend on assigning blame to easily identifiable targets. But there is no single predominant cause of beach erosion. Factors that can influence such erosion include dams on rivers, ports that don't dredge adequately, rising sea levels resulting from global warming, sand mining and catastrophic events like the 2004 tsunami. Of all of these, Roy has elected to concentrate almost exclusively on ports as the culprit threatening beaches. Beach erosion, in turn, is blamed for all kinds of ills for which it's not responsible. In last night's programme, a correspondent from Madras spoke of salinity of water, and Roy annotated this by saying that, as beaches are destroyed, sea water tends to get further inland and contaminate wells. This is not false as an abstract statement, but is absolutely not the reason why Madras's wells have turned more saline. The cause of that is overuse of groundwater, leading to depletion, leading to tubewells being sunk ever deeper, until groundwater levels fall below sea level. "We have far too many ports. We have a 180 odd ports, that's nuts", Roy complained last night. Well, we have over 180 television channels, and that's nuts too. But wouldn't it be worse to forbid the entry of new channels? Wouldn't that be against the free market principles Roy otherwise espouses? Of course, he has never suggested markets ought to be unconstrained by regulation; but then, there ARE regulations governing ports. 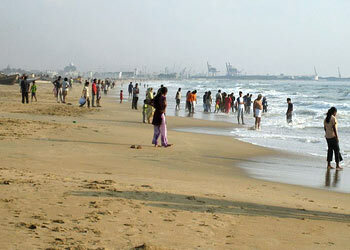 Ports are required to ensure they do not block the drift of sand, so beaches continue to be replenished. The point is not to disallow ports but ensure they obey the law of the land, and punish them if they fail to comply. It would help if NDTV did an investigative report on ports that skirt regulation and harm the environment as a result. NDTV's normal go-to person for environmental causes is Sunita Narain. You can read what I think of her operation, the Centre for Science and Environment, here. Among a series of platitudes on the programme, she indicated it's important that our development move inward. So should we set up a harbour in Chattisgarh next? A dockyard in Sikkim? And is the CSE supportive of any large extant industrial projects in the hinterland? China, by the way, has 2000 ports. I really liked this "Well, we have over 180 television channels, and that's nuts too". roy is for free markets?you have to be kidding me.or do you really think manmohan singh is a free market type too? I don't know where you found me saying Roy is for free markets. I said he's for liberalisation, which is different. If you disagree, please back up your opinion with evidence, rather than just throwing out snarky comments.